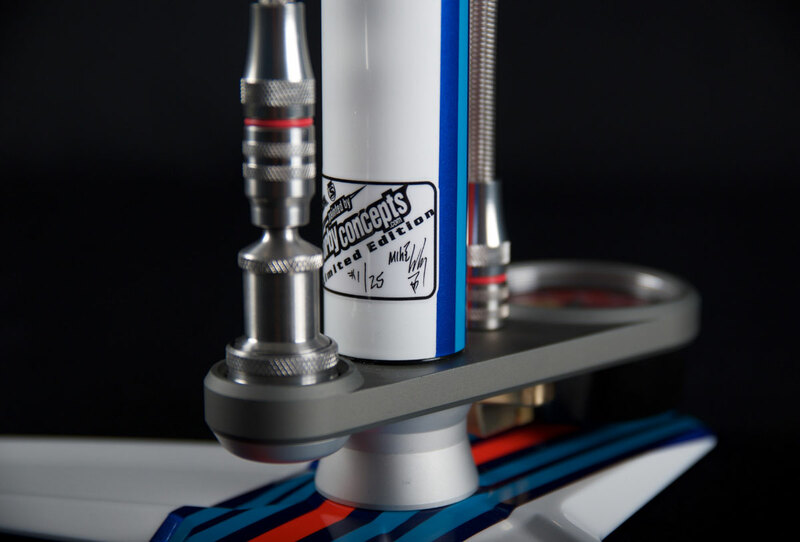 Silca announced today, that it has partnered with this year’s North American Handmade Bicycle Show’s “Best Painter”, Michael Corby, to create a limited edition Martini Racing pump. Each pump features no fewer than 40 masking steps during the painting process, which partakes of a mix of candy and solid paint colors. The pumps will be available in very limited qualities. So, instead of just getting “pumped” over the thought of having one, you best grab one while you can. Each of the pump is hand numbered and signed by Michael Corby, and is available at the staggering price of $900. SILCA ARTIST-EDITION: RACING STRIPE THEME SP ULTIMATE! May in Indianapolis is all about racing, so what better time to celebrate one of the most classic and beautiful of all historic motor racing themes. We have worked in collaboration with NAHBS ‘Best Paint’ winning artist (and renowned helmet painter for Indy, MotoGP, F1 and LeMans Drivers) Michael Corby to create 25 stunning Martini Racing Themed Super Pista Ultimates. Each pump sees more than 40 masking steps on both the tube and the base during the painstaking process of laying the hand formulated paint to create the stripes. This results in a finish that is completely smooth yet appears almost three-dimensional through the use of both solid and Kandy paints. This incredibly difficult technique is a true testament to the skill of this amazing artist that can only truly be appreciated in person. Each pump has been signed and numbered by Michael Corby and will be the perfect addition to your garage, bike room, or vintage racing collection.